"a people without a story." to help consciously shift the story. and on a global level. and start living by conscious design..
We all know someone who is more sensitive than others and more affected by the hardships around them. An essential and new message is coming through, shared by Neale Donald Walsch in his latest book, Conversations With God, Book 4: Awaken the Species. called Pixar from George Lucas. We are witnessing a revolution in human possibility - a growing movement to storm heaven and steal fire. and a weakness at worst. in a productive, balanced life? finally, we get to live a good life. Except, it doesn’t work that way. than what either could do on their own? is about being genuine and real. Others say it’s about being true to yourself. physics, and the cosmos were one. you are not immune to tragedy. A leader is anyone who can see a better future and rally people to reach it. that is threatening the health of every one of us. We are all, every single one of us, heroes. they are making a difference? in the midst of outer activity. No one understands this better than Mallika Chopra. to make decisions every day? a WAY simply surviving can become joyous thriving! End Emotional Eating for Good! to be easier and more fun? and without even realizing it. AMIT GOTSWAMI / QUANTUM CREATIVITY: Think Quantum. Be Creative. and each one of us is a part of it. Ever gardened in a community garden? Mike Dilbeck believes COURAGEOUS LEADERSHIP - when someone moves beyond their fears and intervenes in a situation - is a revolution ... a movement. to a small boy, begging on the streets of India. that makes YOU a hero. For some time now, people have been saying that they prefer spirituality over religion. The world of work is no longer predictable. As it becomes increasingly rare to have a stable career in any field, we're left with patchwork resumes and piecemeal lists of accomplishments. you started 2014 with a New Year's REVOLUTION? DIANNE COLLINS / DO YOU QUANTUMTHINK? IS THAT MIND DOES MATTER. The science that gave rise to the Industrial Age saw the universe as machine. instead of an angry, combative reaction? 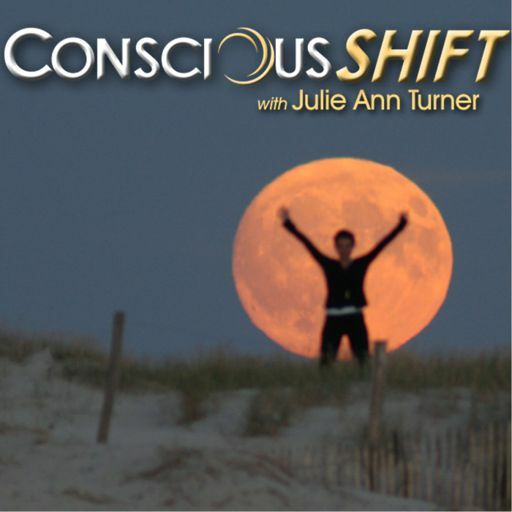 Julie Ann's ConsciousSHIFT guest Marnie Pehrson believes that Light Bearers are rising to lead the way. according to Jonathan Robinson, NYT-bestselling author, and creator of FindingHappiness.com. Ever wonder if that recurring dream meant something? or hear an extremely relevant song playing on the radio related to a friend you've lost ...? hold the keys to optimal health. In a moment of despair, Derek Mills discovered a way to live his life differently - and even cured his stuttering. while others sink to the bottom? Is it "survival of the fittest" - the strongest, and most selfish, win? on new opportunities - is vital. either toward freedom, or toward force. In 1776 we had a Freedom Shift in America. not just the condition of our spirits and our relationships? Well, of course, it DOES! During his 2nd Inaugural Address, President Barack Obama called for us to protect our "National Treasure" - stressing the importance of addressing critical environmental issues, including global warming. Jean Houston, visionary leader and author of "The Wizard of Us: Transformational Lessons from Oz," reveals how the beloved story The Wizard of Oz has the power to reveal the Hero’s Journey that awaits each of us. because they think that's the smart thing to do. and even ‘spiritual enlightenment’ in the future. We long to be complete. trigger anxiety and stress for you? How can we experience this kind of clarity? How can we manage constant stress and anxiety? Charles Darwin and perhaps Richard Dawkins. How do we genuinely and authentically build a global culture of peace? Is 2012 leading up to a doomsday - or a planetary BIRTH DAY - an invitation for humanity to rise to a new level of conscious choice and co-creation? Did you know that the most creative companies have centralized bathrooms? We’ve all experienced flashes of intuition at some point in our lives.In fact, in all likelihood, it's not too much to say that somewhere along the way INTUITION has probably saved your life. James Olson, author of "The Whole-Brain Path to Peace: The Role of Left- and Right-Brain Dominance in the Polarization and Reunification of America,"
There is no area of our lives where we are not forced to step onto the pathway of uncertainty at one point or another - whether it be in our relationships, our careers, our physical health or our finances. Author, "Secrets of Dragon Gate: Ancient Taoist Secrets for Health, Wealth, and Happiness "
Program for Embodying Oneness" on "40 Days to Oneness"
Int'l Bestselling Author: "Choosing Easy World"
"Worldviews: How Science & Spirit Shape Our Worlds"
Julia Farha, Dave Zaboski: Visionaries - "You With the Stars in Your Eyes"